If you are a fan of using story narrative as a means to capture attention, you probably also know that scary things stir the emotions and can be used as a “hook” to motivate students. R.L Stein made a nice living with children’s books which capitalized on this phenomenon and who in a certain generation didn’t curiously find Max’s friends in Where the Wild Things Are to be, at least, little frightening? One of the best things about using the macabre to stimulate interest is that its not necessary to invent ghost stories. It turns out history has plenty of downright horrific examples to exploit in this way. So it is with The Black Death, the ancient deadly disease that wiped whole communities off the map in Asia and Europe. This lesson was developed to support a unit by educators who work in our gifted children’s program and has been successfully implemented with some pretty sharp 4th and 5th graders. It certainly can be modified for a much wider audience, especially secondary students whose analytical skills should be getting a regular rigorous workout. Since I already had extensive experience with this period of history and a background in microbiology, it was easy to create and find appropriate resources for it. So, to start, I wanted to create a “driving question” that serves as a little bait for the “hook”. What happens when a deadly disease strikes a community? The first thing students need for this project was a little background as to the events. As is my habit, I created a KMZ file as a device to organize my lesson resources and leverage Google Earth to incorporate the geographical context of the lesson. In this case, the data and information mostly pertains to medieval Europe, so I put the place marker in France. The first link inside the place marker is to a short narrative which tells the students what the plague is. This can be read independently, but I’ve been working with small groups of motivated students, so I generally display Google Earth on a presentation device (big HD TV or interactive whiteboard), pull up the narrative and let students read aloud. This also provided a great opportunity to ask at least a few questions about the geographic context of the topic. Since my students are novices in analyzing graphs, this images was modified with some orienting points to make it a bit easier to get started with analysis. The actual form is linked here. It starts with basic closed ended questions to guide the students and requires them to read, calculate and interpret the data . Each of my students has their own computer to analyze the data and complete the entry from. It wasn’t necessary to create all the resources for this lesson. With just a little bit of searching I was able to find a KMZ file in which someone had added a historical time line overlay which shows the spread of the plague through Europe. The analysis of this information was also part of the form. How is it possible to calculate populations changes? What social institutions in Europe kept records? How are the events of the Black Plague depicted in literature and art. Is plague still a problem in the world today? If so, where? Is there plague in the United States? Generally this a pretty entertaining way to get students to process some data and think critically about it. Armed with some really good resources and a great interactive application like Google Earth, one can provide a learning experience which goes far beyond the simple goal of analyzing a graph. With just a little bit of extra work the student can experience something relevant and rigorous and maybe even interesting. 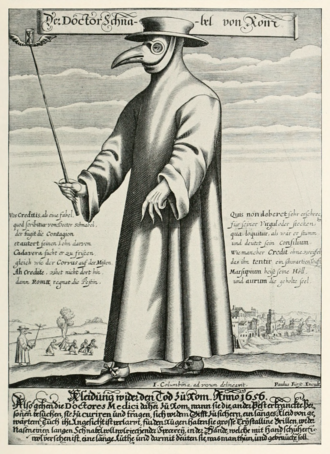 As if it could be worse, if you got the plague in the 16th century and did see a doctor, their official clothing for plague fighting is shown in the image above. Apparently the beak had herbs stuffed in it to prevent the spread of disease. Surely one would be convinced that hell was just around the corner when one of these guys came to the home. Imagine this as your last visitor.